Generic Company Place Holder Doodle Jump - BE WARNED: Insanely Addictive! Frankly, I didn’t want to review Doodle Jump, a $1 iPhone game from Lima Sky. That’s because I didn’t want to stop playing the darn thing. Onward and Upward: Navigate your hand-drawn creature upward in Doodle Jump, but be careful—those brown platforms aren’t very stable. You control a hand-drawn creature of some sort, whose only goal is to get higher. As you tilt your iPhone from side to side, the creature jumps on the different bouncy platforms you aim for. Your aim is go as high up on the infinite playing field as you can. If, at any time, you fall below the screen, your game is over. Okay, there’s some nuance. While most platforms are “normal” stationary green ones, you’ll also encounter brown ones that break if you land on them, and blue ones that move. Some platforms even disappear. Occasionally, you’ll spot springs on some platforms which propel you much higher than a normal jump—wheee! And as you get higher, you’ll encounter an increasingly varied array of obstacles whose touch causes instant death—monsters, UFOs, black holes, and more. You can shoot them (by tapping the screen), or just avoid them. High scores are implemented beautifully. There’s a global high score list to compete against the world, and as you play, the game shows the heights that other players have reached along the edge. It’s cool. Doodle Jump also integrates with Facebook Connect, so you can instantly blare your score to all your friends there. 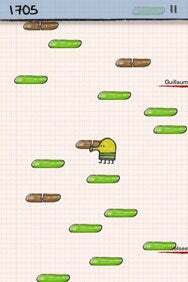 Doodle Jump is a perfect micro-game, insanely addictive, and deliciously replayable. Go get it. Doodle Jump is compatible with any iPhone or iPod touch running the iPhone 2.x software update.